Perhaps the most significant addition to Oregon football’s 2015 roster came a week after national signing day. Eastern Washington star quarterback Vernon Adams announced via Instagram Monday morning that he is headed to Eugene, where he will presumably be the front-runner for Oregon’s vacated starting quarterback job. Talk of Adams’ possible transfer to Oregon surfaced late last month, really picking up steam a little more than a week ago. Duck Territory, 247Sports’ Oregon site, had it first with The Oregonian‘s Jen Beyrle reporting Adams was set to visit the campus the weekend of Jan. 31. Rumors of Texas also being in the mix for Adams in his final year of eligibility percolated late last week. The last two times Oregon went head-to-head with a Texas school for a dual-threat quarterback, the Ducks lost out. Most recently was Texas A&M signee Kyler Murray, and four years ago, when A&M landed Johnny Manziel. Oregon was just fine with Marcus Mariota, who won the 2014 Heisman Trophy and led the Ducks’ to last season’s national championship game, but Manziel had a nice career of his own. And Vernon Adams draws comparisons to Manziel’s style of play. 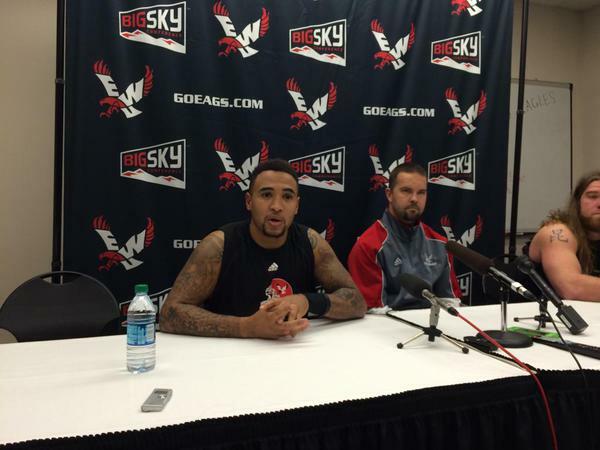 Like Manziel, Vernon Adams is somewhat undersized; he’s generously listed at 6-foot. However, also like Manziel, he has a cannon arm one would not expect of a quarterback his size. Combine that with explosiveness scrambling out of the pocket, and Adams comes into the Pac-12 already one of the most physically intriguing quarterbacks among likely 2015 starters. That he has three years of experience starting for an Eastern Washington team that was consistently in the hunt for the FCS championship, and Vernon Adams should have a leg up on Oregon’s Jeff Lockie. And that experience is one of several qualities that make Adams perhaps more comparable to Russell Wilson than Manziel. While Adams was dubbed “Vernon Football” for his similarities to the 2012 Heisman winner, he uses his ball-carrying ability more as a complementary asset than a primary weapon. Such is the case for Wilson, both in his NFL career with the Seattle Seahawks and during his college career at NC State and Wisconsin. Wisconsin in particular didn’t need Wilson to shoulder too much of the load via the run because the Badgers had Heisman finalist Montee Ball during Wilson’s one season in the program. Likewise, Vernon Adams joins an Oregon backfield loaded with breakout star Royce Freeman, as well as the talented Thomas Tyner. Adams’ place in the Ducks offense will be much like Wilson’s at Wisconsin, or Mariota before him at Oregon, and less similar to Manziel at Texas A&M. Another comparison to Wilson? The two-time NFC champion to whom Adams reached out last week is the quintessential, and one of the few examples of a one-year transfer quarterback who succeeded in the jump Adams is attempting to make. Wilson helped the Badgers to the 2011 Big Ten championship and 2012 Rose Bowl after three outstanding years at NC State. Other programs have tried to emulate this blueprint. Ole Miss is one, which welcomed in Jeremiah Masoli, coincidentally a former Oregon quarterback. The Rebels offense never quite took off with Masoli replacing Jevan Snead in 2010. Likewise after Wilson’s departure, Wisconsin turned to Maryland’s Danny O’Brien. Though O’Brien had more than just one year of eligibility remaining, he was able to play immediately. The 2011 ACC Freshman of the Year seemed like a natural fit to take over the Badgers’ offense, but he was instead one of several players to ride Wisconsin’s still on-going carousel of quarterbacks. And therein lies one challenge Oregon head coach Mark Helfrich faces. A quarterback transfer situation can be a two-fold problem in that an incoming player stepping ahead of quarterbacks already in the program–in this case, Lockie and Morgan Mahalak–prevents the returners from gaining first-string reps. In 2016, Oregon would then be starting fresh for a second consecutive season, again with quarterbacks having little-to-no meaningful game experience. But, to be fair, the last two times Oregon started a new quarterback–2010 and 2012–the Ducks went a combined 25-2. Adams should not have too much difficulty adjusting to the offense. Beau Baldwin’s wide-open style was one of the most explosive in the FCS, though more based on the pass than Oregon’s system. Still, the principles are similar enough that Adams will not be on a steep learning curve. And given Adams scored 13 combined touchdowns in games against Washington and Oregon State the last two seasons, facing Pac-12 North competition should be no sweat for him. Now the real challenge is how he performs in his Oregon debut, Week 1 against…Eastern Washington.